SIMPSON BAY - Due to the passing of Tropical Storm Gonzalo, WINAIR would like to inform all customers that all flights have been cancelled until tomorrow, Tuesday 12PM. 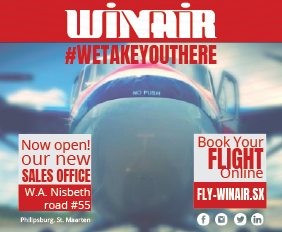 As per safety of our aircrafts, Winair will fly our aircraft to St. Lucia until tomorrow and return in the morning once weather permitting. As per safety of our employees, please note that the Winair offices will close at 12PM including the airport terminal staff. Staff will report to work at 8AM tomorrow morning weather permitting. PHILIPSBURG - On behalf of the Windward Islands Bankers Association;All Banks will closed today at 11 am due to prevailing weather conditions. Banks will re-open on Tuesday 14 October, regular banking hours based on weather conditions on Tuesday morning. PHILIPSBURG - Postal Services St. Maarten N.V. (PSS) would hereby like to inform the General Public that our Philipsburg branch and other locations closed today October 13, 2014, from 11:00am until further notice. PSS management is closely monitoring the approaching Tropical Storm Gonzalo in respect to the official resuming of operations for tomorrow. A subsequent press release will be sent in reference to when PSS will resume its operations based on the weather conditions. PSS management apologizes for any inconvenience this may cause our loyal customers and urges the entire community to remain safe. PONDFILL, PHILIPSBURG - NV GEBE would hereby like to inform the General Public that our Philipsburg and Simpson Bay Offices will be closed today October 13, 2014, with the exception of continuous services. Our toll free 1 844 4323 213 number is presently being serviced however; please call our additional numbers1 721 544 3100or1 721 542 2213should you need emergency service. Our normal working hours will be resumedtomorrowOctober 14, 2014. POINT BLANCHE – The cruise vessel Explorer of the Seas of Royal Caribbean Cruise Line has cancelled its Monday visit to the country. The cancellation is due to the forecasted passing of Tropical Storm Gonzalo which was located at 5.00pm on Sunday 258 miles east southeast of Sint Maarten. Tropical Storm Gonzalo is forecast to pass through the Leeward Islands including Sint Maarten on Monday morning. Three men arrested for threatening and possession of an illegal fire-arm. CAY HILL - On Friday October 10th between 11.0 p.m. and 11.30 p.m. police patrol from the Philipsburg area investigated a complaint of a threat with a fire-arm on the Hyena road in Cay Hill. The suspect with the initials J.D.C. (43) was arrested at his home on Hyena road. During a search of his home a rifle and a handgun were found and confiscated. The suspects J.M.C. (40) and F.A. Q.H. (32) were arrested in the Sucker garden area after an illegal fire-arm was located in the center console of the vehicle the suspects were driving in. CAPE BAY - On Saturday October 11th at approximately 01.00 p.m. a police patrol from the Simpson Bay District was directed by the central Police Dispatch to Cape Bay in the area of the horse stable to investigate a case involving three young men who were in the possession of a fire-arm and were firing shots. The central Dispatch also gave a description of the men involved in this case. On the arrival of the patrol on the scene they saw three young men who fit the description that were given to them. When the patrol approached them, one of them took- off running. At the same time the investigating officers saw when this suspect threw something away. One officer chased this suspect on foot; however he managed to get away. The other two suspects remained standing while the officer did their investigation. A search of the immediate area led to the officers finding a loaded modified handgun. This fire-arm was immediately confiscated for further investigation. The two suspects with the initials M. J.L. (16) and J.D. (15) were arrested on the spot and transported to the Philipsburg Police Station for further investigation. OYSTER POND - On Saturday October 11th at approximately 03.45 a.m. a Philipsburg Police Patrol was sent to Oyster Bay Resort to investigate a case of breaking and entering. On the scene the patrol spoke to one of the on duty security guards who stated that two young men were caught on the premises carrying a black flat screen Toshiba television. When they were being questioned by security as to where and how they had gotten the television, they took –off running leaving the television behind. However shortly after they were caught by other security officers on the premises and held awaiting the arrival of the police. The suspects with initials J.L. (24) and R.C. (19) were arrested on the scene and taken to the Philipsburg Police Station along with the television which was also confiscated for further investigation. PHILIPSBURG - 1st accident took place around 03:30 am on the Airport Road in the vicinity op Arrindell Aviation. A silver Suzuki Grand Vitara P-9541 collided with a Mitsubishi Eclipse P-2015. After the collision for unknown reasons the Suzuki Vitara travelled on three wheels for more or less 215 meters before it came to a full stop and almost reaching the round a bout at Maho Reef. The accident left both vehicles unable to drive. A silver colour Nissan Almera M-2501 with 6 persons inside lost control while driving at high speed and collided with the guardrail on the left side op the road after which the car spun out and hit the guardrail a second time. Two passengers where injured. One male passenger received stitches to his left temple and a female passenger received cuts to her inner mouth. The vehicle was heavily damaged. The guardrail and a light post were also damaged. A silver Ford Fiesta BP 064 NG driver lost control of his vehicle while travelling on the Union Road at the entrance to Port de Plaisance and collided into a light pole after which the car came to a stop on the grass on the side of the road. The driver fled the scene leaving the vehicle behind. All vehicles were towed away for further investigation at the expense of the owners. SIMPSON BAY - Red Cross St. Maarten held a successful fire training today-Sunday. The preparation and execution was done in conjunction with the St. Maarten Fire Department. Role players were from the American University of the Caribbean, Dutch Marines and a children's home. PHILIPSBURG – Ministry of Public Housing, Environment, Spatial Development and Infrastructure (Ministry VROMI), hereby announces that there will be interruption to the traffic flow at a section of Front Street for two days. The interruption to the road traffic will be on Saturday, October 11th and Sunday, October 12th from 8.00PM to 10.00PM, a two hour period each time. The disruption is in connection with reconstruction of a business on Front Street. CAPE BAY - NV GEBE expresses regret for the outage that occurred on October 9, 2014, starting at 1:29PM. This interruption caused the entire Southern side of the island to experience a total blackout. After assessment of the problem, the gradual restoration process started around 5:45 PM and was expected to be fully restored by 10.00PM Thursday night if no further technical difficulties are encountered. The Managing Board states that the Engineers from NV GEBE have been working non-stop at the Cape Bay Power Plant and substations to rectify all issues that developed due to the outage. A subsequent and a more detailed press release will be forwarded to all media houses once full assessment have been made. HARBOUR VIEW - On Friday morning 15 Members of Parliament (MPs) for the governing period 2014-2018 took the oath of office in the presence of His Excellency Governor Eugene Holiday. The next phase of country Sint Maarten's constitutional government is the parliamentary session on Friday afternoon where the new sworn in MPs will have their first public plenary session of the House. ARCHIVED: On Friday October 10, 2014 the 15 elected members of the House of Parliament will take the oath of office before His Excellency Governor Eugene B. Holiday at the Cabinet of the Governor. The ceremony will be broadcasted live on Sint Maarten Cable TV channel 120, commencing at 09.50 AM. PHILIPSBURG - Today, on October 10, 2014 a 17-year-old man, S.G., was arrested in Sint Maarten on suspicion of murder/manslaughter. The arrest took place in the investigation "Chuchubi” that started yesterday after a shooting in the store “Most Requested Flex” in Front Street, in which a young man was killed. The suspect reported himself at the police station and is now being questioned. He will be placed in police custody. Given the current investigation, the public prosecution service will not give further comments. ARCHIVED: On Thursday, October 9th , at approximately 05.15 p.m. a phone call came into the police department stating that a man had been shot at the Mid Town Motel on Front Street and that an ambulance was needed. Immediately after receiving this information several police patrols and paramedics were sent to the scene to investigate what had taken place. On the scene the patrol encountered the lifeless body of a man who was found in the FLEX DVD- store. The identity of the victim, at press time had not yet been established. The victim who later was pronounced dead by Dr. Mercuur had been shot. Front Street and surrounding alleys were closed off during the investigation. The Forensic department and Detectives were on the scene collecting evidence and questioning potential witnesses. The investigation has just begun and it is still unclear exactly what took place, why and who is responsible for this shooting. GREAT BAY– POWER HOUR is fast approaching. On October 17, 2014 entrepreneurs on at various stages and professionals will come together at the St. Maarten Harbor from 7:30 – 9:30 pm to gain tips and tricks from successful entrepreneurs and leaders. Foundation INFOBIZZ, which is started to assist in developing successful entrepreneurs, is busy putting the last adjustments for this POWER HOUR and gearing up for the GLOBAL ENTREPRENEURSHIP WEEK in November. To accommodate the overwhelming response from men, the theme has been adjusted to reflect their inclusion and is now “HEELS & CUFFLINKS”. Hosted by Foundation INFOBIZZ, the POWER HOUR was designed to inspire and empower entrepreneurs and entrepreneurial professionals by providing them with tips and tricks from those who have already achieved success in their business and industry. Known as networking for movers and shakers, the POWER HOUR has been able to inspire and empower close to 200 entrepreneurs in a short period of time. “We listen carefully to the feedback from those that would like to join us and those that have been part of the POWER HOUR. What was consistent was that men did not know if they could also join the ladies for Heels & Cocktails. So with some help of some creative geniuses we said we’ll call it ‘HEELS & CUFFLINKS’, said the founder and director Ife Badejo. There is not strict dress code, although the organizers recommend that the participants come in business casual attire and prepared to do business. Also, vendors are encouraged to register no later than October 15, 2014 and no tickets will be sold at the door. Tickets are $30 and vendor tables are $100 including admittance for two. PHILIPSBURG, Sint Maarten – Ministry of Public Housing, Environment, Spatial Development and Infrastructure (Ministry VROMI), hereby announces that there will be a partial road closure on October 8th. The interruption to the road traffic will be on Wednesday from 9.00AM to 11.00AM. There will be no through traffic on Simpson Bay Road coming from the Police Sub Station on to the aforementioned road. The civil works are related to the pouring of cement. A concrete mixer truck and pump truck will be parked on the road during the aforementioned hours. Ministry of Public Housing, Environment, Spatial Development and Infrastructure (Ministry VROMI), hereby announces that there will be a partial road closure on October 9th. The interruption to the road traffic will be on Thursday for a period of one day. Traffic on Queen Conch Shell Road have to pay keen attention as the intersection at Queen Conch Shell Road and Guys Estate Drive will be disrupted, as NV GEBE will be carrying out civil works in this area related to a water leak. The second disruption to vehicular traffic will take place at the intersection Queen Conch Shell Road and Ark Shell Road. NV GEBE will be working on a water line for the area and road crossings will be placed at both intersections. Special measures will be in place for emergency service vehicles. Motorists are requested to be vigilant and observant for the traffic directional signs. Heavy machinery will be in use.